The man of many nicknames, Shaquille O'Neal dominated basketball for years and his on-court ability was equally matched by his off-court personality. As a rookie, his cards were once the hottest option in collecting and although the demand and value for his cards has cooled over the years, Shaquille O'Neal is still a very popular option for collectors. 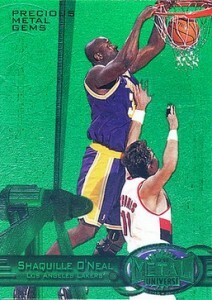 Shop for Professionally Graded Shaquille O'Neal Cards on eBay. While he is remembered most for his time with the Orlando Magic, Los Angeles Lakers and Miami Heat, Shaq's final three seasons were spent playing for the Phoenix Suns, Cleveland Cavaliers and Boston Celtics. The 15-time All-Star won four titles and three Finals MVP awards and is a lock for the Hall of Fame. Intense collecting interest for Shaquille O'Neal began not long after he was drafted first overall thanks to his inclusion in 1992 Classic products. From there, collectors have plenty of choices for O'Neal and ten of his top cards are highlighted in the guide below. For a complete look at his early card options, view our detailed Shaquille O'Neal rookie guide. Click on the listing or image to shop for cards on eBay. 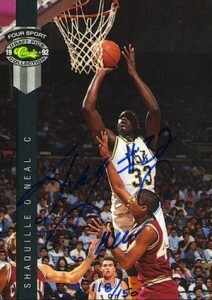 Collectors who were active during this period will undoubtedly remember the hoopla surrounding Shaquille O'Neal. Classic Games, a pre-rookie/prospect card company that was big in the 1990s, managed to get a temporary exclusive and they certainly did not play it conservatively. 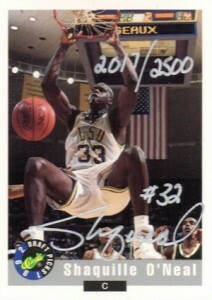 O'Neal signed thousands of cards for Classic across several brands and they featured the big man during his LSU days. 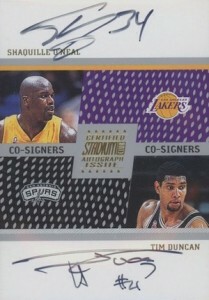 While prices have come down considerably over time, these early cards were the first chance to own a signed card from Shaq and they are all signed on-card and hand-numbered. 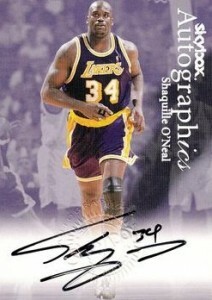 Because of his deal with Classic, collectors had to wait on official NBA cards for Shaq. In place of the actual cards, redemptions were issued to give collectors something to start with. 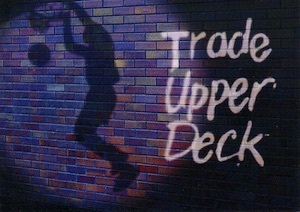 This is exactly what Upper Deck Series 1 did in the form of a "Trade Upper Deck" card. While his official rookie was found in Series 2 as a short print, the redemption version is virtually identical except for the gold foil headline at the top of the card that says "TRADE CARD." 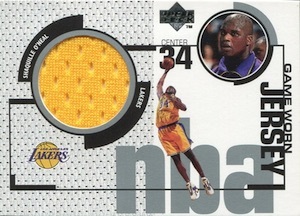 Easily the most popular early card for Shaquille O'Neal, the colorful Beam Team inserts sold for hundreds in their heyday. Intended to resemble the popular laser halftime show during the 1992-93 season, the cards still see considerable interest. While the pack-pulled version is more valuable, there is also a "Members Only" parallel that was part of a factory set. Collectors can distinguish the two based on a watermark found on the Members Only card. Presenting a kaleidoscope of color, 1993-94 Finest may not yield huge sales, but the product's effect on the hobby is hard to overlook. While the shiny Refractor parallels produce the biggest values, they still can be found for reasonable amounts. PMGs are some of the most coveted 1990s parallels and their rarity and condition issues are a huge reason why values continue to push higher. Although the 1997-98 Metal Universe Precious Metal Gems parallel for O'Neal is numbered to 100, the first ten are green foil and the remaining 90 feature red foil. Neither version is easy to track down. 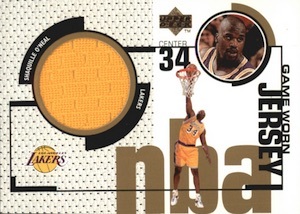 Noteworthy as the first relic card for Shaquille O'Neal, collectors can find two different Game Jersey options in 1998-99 Upper Deck. The version with a silver font (#GJ4) is found in both hobby and retail boxes, while the gold version (#GJ34) is only found in hobby packs. 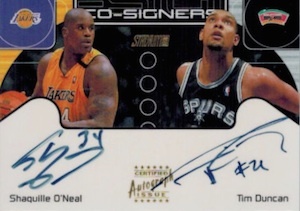 Although O'Neal was not included in the first three editions of Autographics, collectors finally got their shot in 1999-2000 Fleer/Skybox products. In addition to the base version, there is also a Purple Foil parallel, numbered to 50. 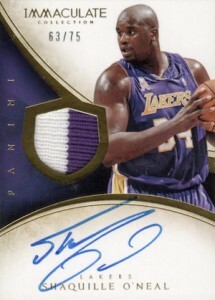 While these rarely surface, Shaq has a good number of other signed cards to chase. It's hard to think of two big men who saw more success in the 1990s and 2000s than Shaquille O'Neal and Tim Duncan. The two were featured on Co-Signers inserts in 2000-01 and 2002-03 Stadium Club and both include on-card autographs. Kobe Bryant and Shaquille O'Neal won three consecutive titles with the Lakers. Although their time as teammates ended on bad terms, it is hard to view their overall partnership as anything other than an immense success. Despite this, it took over a decade before collectors were able to pull a dual-signed card from the pair. Limited to just 15 copies, the 2012-13 National Treasures Champions Signatures would be even more impressive if both had on-card signatures instead of just Bryant. 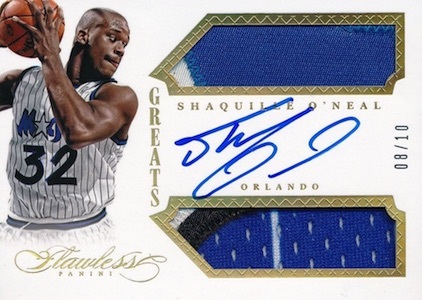 Among several high-end autograph options for Shaquille O'Neal, standouts include Immaculate Collection, Flawless, and National Treasures. While it is hard to argue one as the best, the top options include a nice patch along with an on-card signature and low print run. 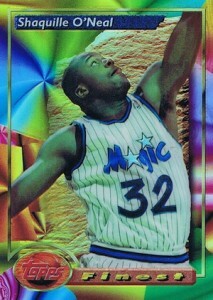 SHAQUILLE O'NEAL, PEPSI PROMO CARD, GOLD BORDER, ROOKIE OF THE YEAR.GOLD SIG. 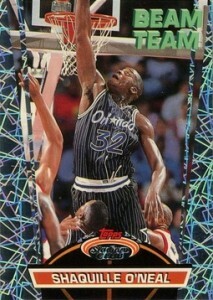 How much would a shaq rookie card be worth from 93-94, in the fleer series. Rookie is stamped on front. 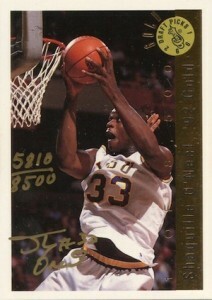 Hello, Any idea of value of 1992 Shaq Oneal LSU big blue dream team 9 card uncut sheet? Thanks! Hello. Any idea what shaquillle oneals big blue dream team LSU uncut sheet is worth? Thanks! Shaquille O’Neal Super Shaq protected card on a plaque. Shaq has black jeans and jacket with Superman S on shirt, coming out of a phone booth. 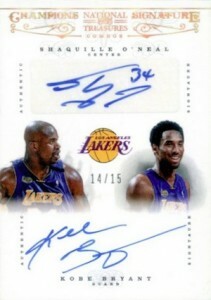 Hologram signature and “Super Shaq”. How much would this be worth? Have a misprint here in Germany. 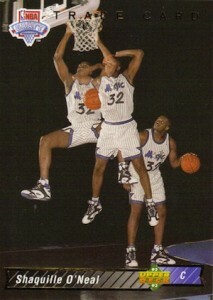 96-97 Flair Showcase hot shots showing shaq, printed name is michael Jordan. I would like to sell it. 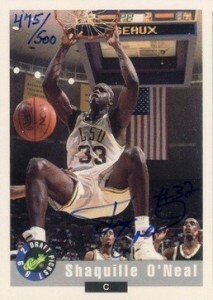 I have an upper deck 92-93 shaquille o’neal card. Mint condition. The only number I can find is AD1. What can you tell me about it? Sounds like the All-Division Team insert. Those sell for a few bucks ungraded but can get in the $50+ range for high-grades.